Like most rescue professionals, ski patrollers ultimately collect great stories – about things they’ve seen and done, people they’ve encountered, close calls… It doesn’t take long to build a quiver of anecdotes to entertain over a round of beers. Those stories always seem to come out. (The joke goes “How do you know a ski patroller? He’ll tell you.”) For one Breck patroller however, even an appearance on the Discovery Channel (where Mike Rowe poured her a beer) and a “Characters Welcome” commercial aren’t enough to get her to talk. 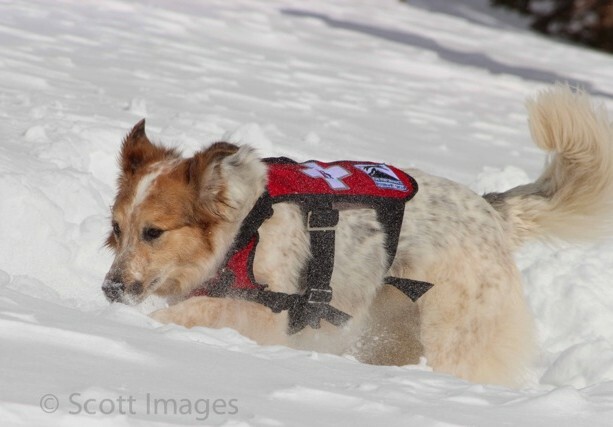 Tali is a border collie / English setter mix who has served as an avalanche rescue dog with Breckenridge Ski Patrol for five years. It’s fitting that she would lead a life built around rescue, as she was rescued from an Eagle County shelter six years ago at six months old. Hunter Mortensen, a Breck patroller, came across Tali after she was transferred from a Mesa County shelter to the no-kill shelter in Eagle County. Hunter brought her home, and she immediately showed the intelligence and temperament required of an avalanche dog. Together, they started the process of certification. 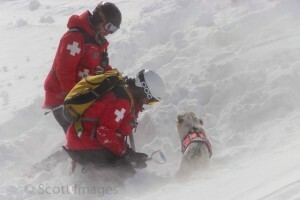 To become a CRAD (Colorado Rapid Avalanche Deployment) certified search-and-rescue dog is no small undertaking. Once training begins, it takes about two full years of training and testing to receive certification. Handler and canine become a team, and each must learn not only the technical aspects of search and rescue, but also to trust each other implicitly. In order to keep her skills sharp, Hunter and Tali train throughout the winter season. Volunteers allow themselves to be buried in a designated field at the ski resort, and Tali’s job is to find them. She takes great delight in digging, because in training there is always a reward – a ball or a Frisbee to play with. Training is a game for Tali, but always present is the idea that one day the game may mean the difference between life and death for a skier trapped in an avalanche. In her five years of service, Tali’s skills have not been needed at the ski resort. Thanks to an aggressive and hugely successful avalanche mitigation program administered by Breckenridge Ski Patrol, in-bounds avalanches have been nonexistent. A few skier-triggered slides have occurred out of bounds, but no skiers have been caught in them. Tali also serves with Summit County Search and Rescue, and has been called upon in that capacity, assisting with a recovery of a backcountry snowmobiler. More recently, she and Hunter traveled to Rocky Mountain National Park to join a search for a missing man. The demands of the job are hard on a dog. The average length of service for an avalanche dog is about eight years, so Tali may well be on the back side of her career. The physical nature of the job also typically shortens a dog’s life expectancy – working dogs sleep less and are taxed physically and mentally. But after getting a new lease on life six years ago in Eagle County, Tali is happy to sacrifice a few extra months or years of leisure to help others get a similar reprieve. If you stop in at a patrol hut on a day she’s working, you’ll likely find her looking out the window, watching patiently for Hunter to come back. They’ll go outside and have a catch, and it becomes obvious that sometimes a rescue has a happier ending than anyone could predict. 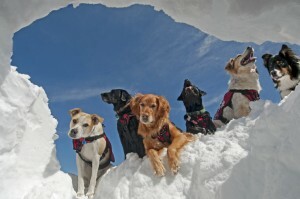 To donate to the Summit County Rescue Group, an organization that helps train rescue dogs and pays for their medical care. please visit their website. Another blog post from my hubby Brad on his favorite topic – dogs! Feel free to donate to SCRG – and include a note that your donation is for the Breck CRAD dogs! (Photo credit for the first two images: Scott Brockmeier, scott-images.com).